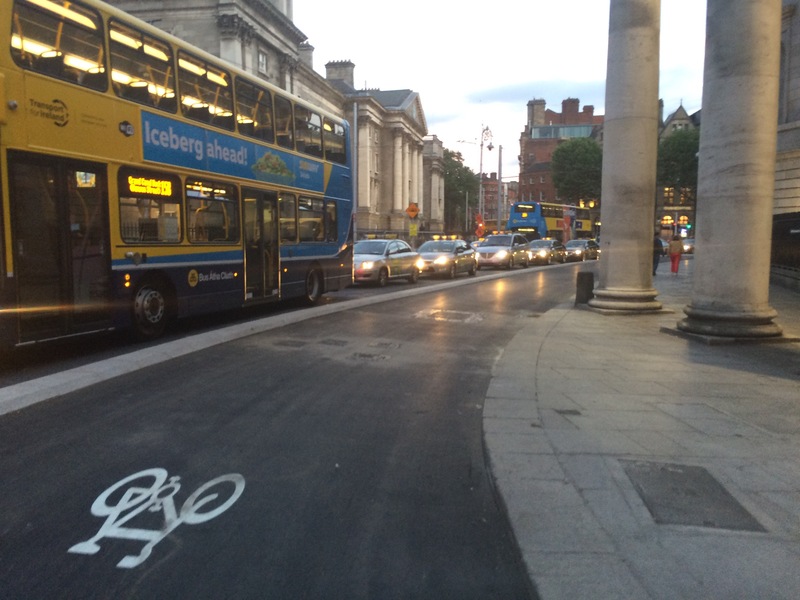 While things are still up in the air regarding Luas Cross City and city, one glimpse of hope os the short but welcome new section of cycle path on College Green. 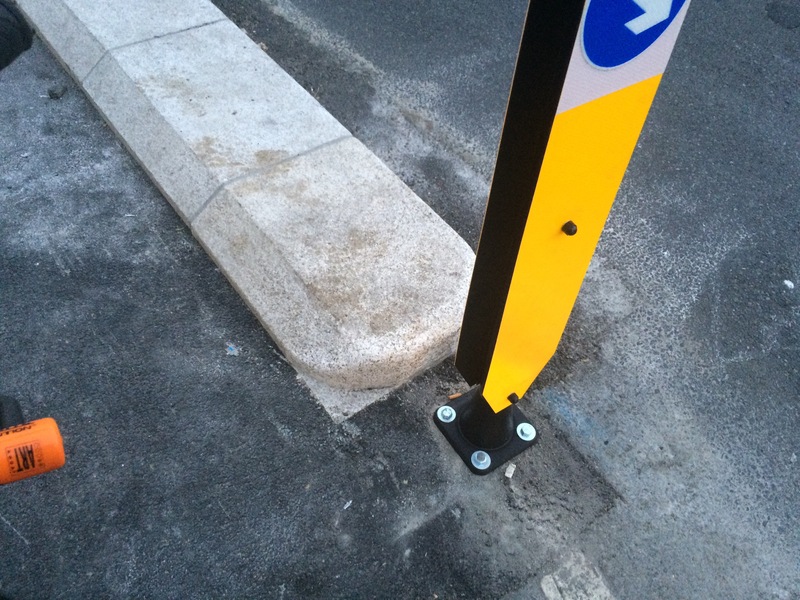 The reason why it’s so wide is because it should eventually become part of a longer two-way cycle route. It will link into both College Street and Westmorland Street, although exactly how is not yet public. It will also link into the planned (and near invisible) east-west cycle route alone the south side of the proposed College Green Plaza. Yep it’s sweet, found myself on it yesterday. May it be a taste of things to come! Wow! Is that…? no wait, my eyes deceive me… hang on, yes, that looks like physical separation! Could the penny finally have dropped at DCC? Let’s hope so. A major improvement. I passed there twice this week and didn’t see it coming. This is great. Looks great ,seen it being put in but have not used it yet. The problem is when you get past this spot on way to O’connell Bridge you have Buses and Taxis cutting in front of you to get over to the left to either Park at Bus stops or else go down Astons Quay. So you have to watch out for this and be prepared to stop if you have to. 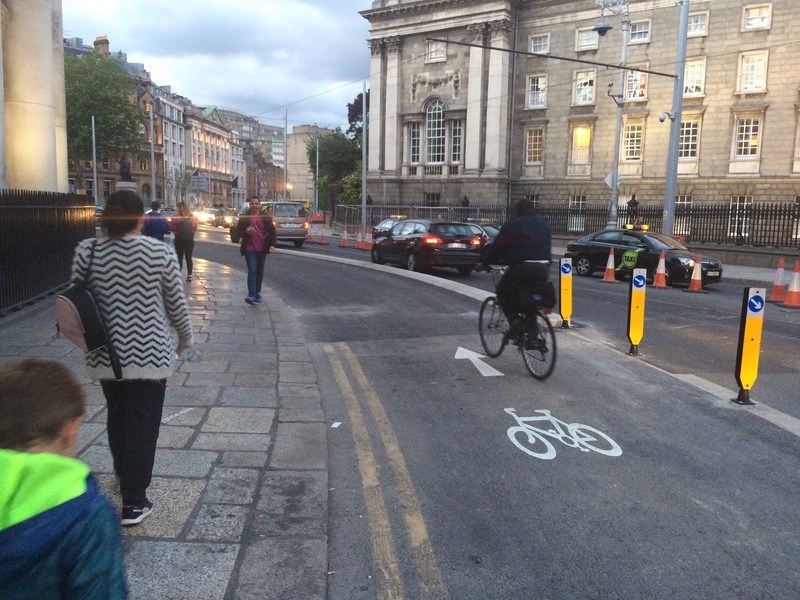 I would have liked if this Cycle Path continued up to Grafton St Nassau St Junction, badly needed. 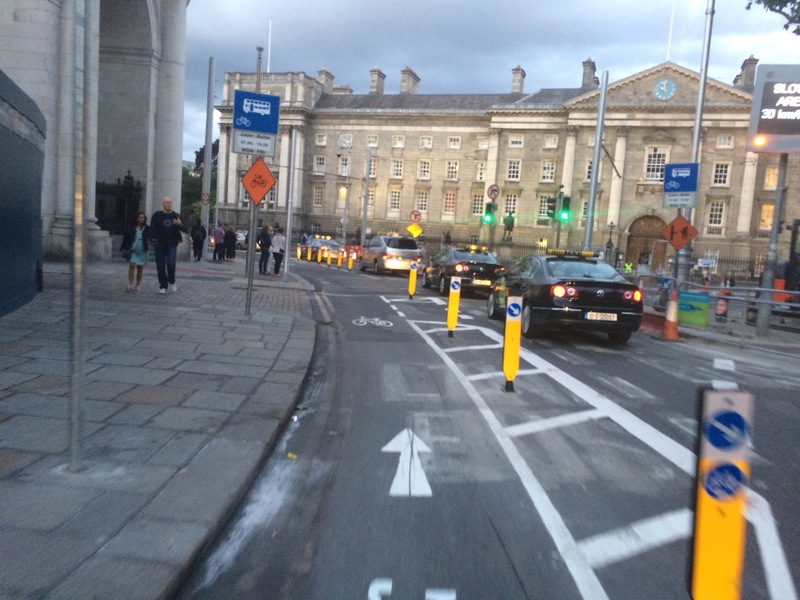 This is good progress on reclaiming Dublin city. 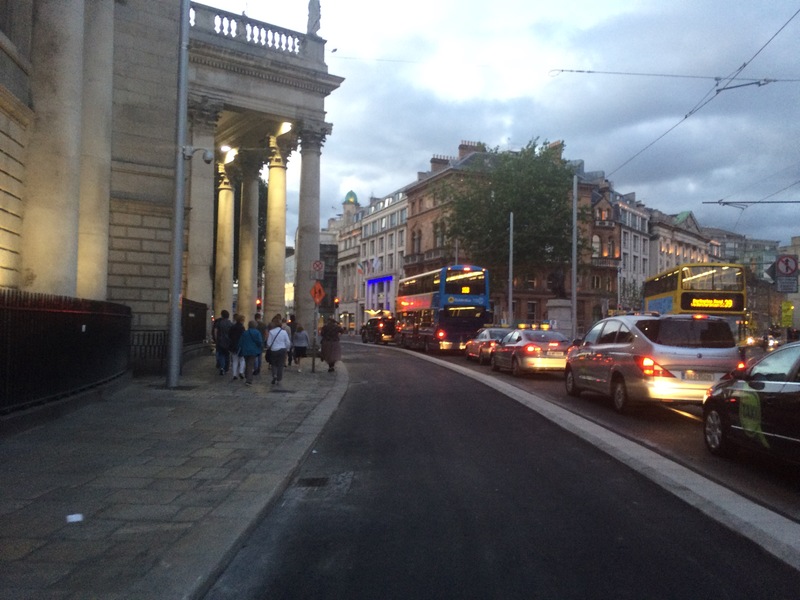 Looking forward to see the completion of city centre cycling network in the near future. What’s the idea with the acute angle onto/off College Green? 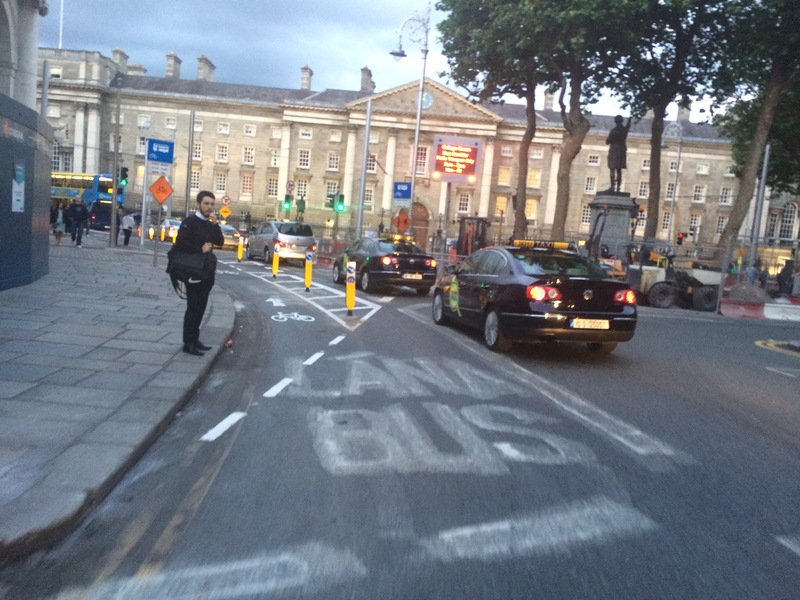 Is the cycle lane going to go up Grafton st? How do you get from the cycle lane to Ringsend? Suddenly veer right across all the traffic at the westin? Do the traffic lights at the finish give an advance go for cyclists, or is it green for motor and cycle traffic at the same time? @Badger as outlined in the article above, the section of cycle path shown in the images with the bollards will be consumed by the planned plaza design. This is great but would be even better if they could have a separate cycle phase at the lights. 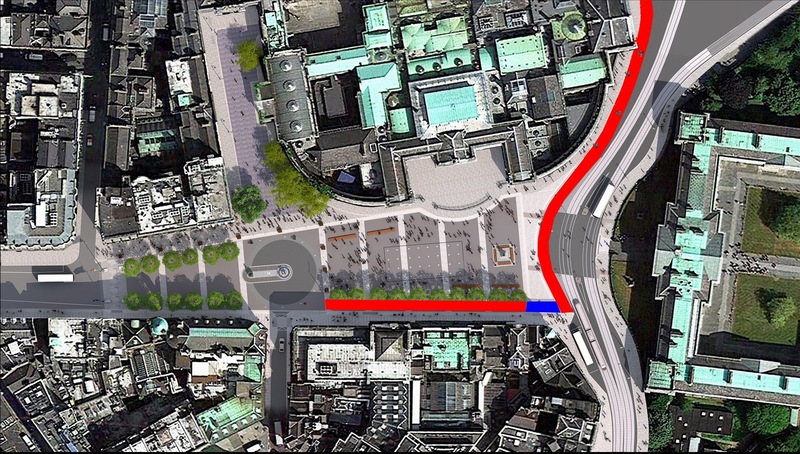 Give people cycling a chance to filter across into whichever lane they need without having to yield to motor traffic coming from Dame St. This was a small pond the other day. And if turning right to Fleet St. incredibly dangerous. I’ll be avoiding it like most cycle lanes for my safety. 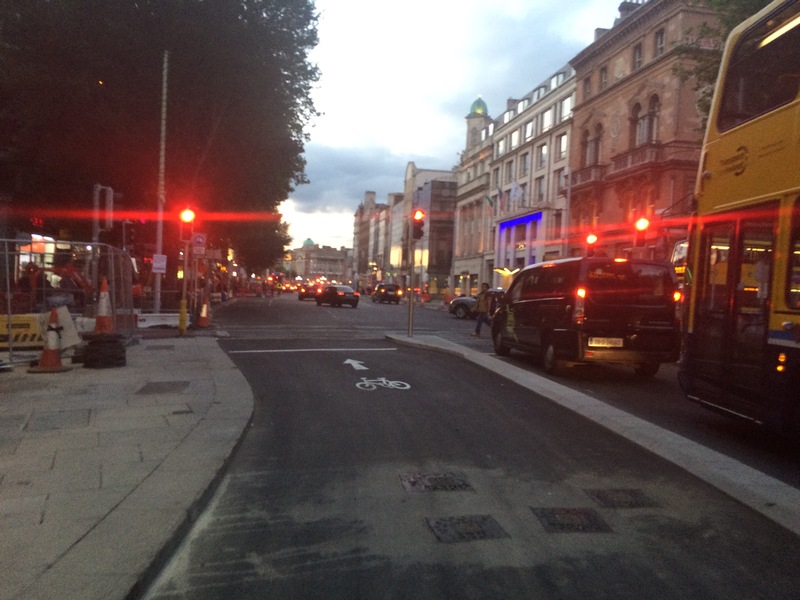 A huge and very dangerous flaw with this cycle lane is that you now have to take your life in your hands to turn from Westmoreland Street into Fleet Street, as I do every morning. Beforehand, you could move into the turning lane on the right hand side. Now cyclists are trapped in the leftmost lane all the way to the traffic lights, which forces you to turn right across a straight-ahead lane – an inconvenience if the lights are red, but a veritable death-trap if they’re green.